After getting off at Sevilla station in Spain, I found a nice looking restaurant located at the back alley of the old town district. This happened while I was walking around to find a place to sleep over. The inner part of the restaurant was connected to the hotel, and I asked how much it costs to stay. Despite how the price was slightly higher than what I can afford, the fact that I can stay at this nice restaurant intrigued me, and at the end, I decided to stay at this hotel. First I put my belongings in my room and headed to the restaurant. There is a terrace right in front of the small, white-walled building, and the tables are lined on top of the stone pavement. As I took a seat on the terrace side, I was able to realize a sunlight that shines the clean, white table-cloth. It was already past seven at night, but since it was still summer, the outside was still bright, and people are drinking aperitif as a start of their long and enjoying night. As the sky gets slightly darker and the temperature cools, a pan of paella was brought to the table. The friendly waiter takes portions from the pan and places it on the plate along with some lemons. The aromatic smell of the rice and the sour smell of the lemon spreads right in front of me. As I drink some beer and enjoy the food, a musician comes to my table with a guitar in hand to play a tune. As the musician approaches to my table, he takes off his hat and bows, a played a tune that was sentimental yet passionate on his guitar. After the performance, I said gracias to express my feeling of appreciation, handed him some tip, and resumed on enjoying my meal. I had a chance of eating paella in Japan several times after my trip to Spain, but it never exceeded the impression I had at Sevilla. Eating a certain food at the place being traveled and eating that same food in Japan later is totally different, and the latter case does not bring that much satisfaction. The taste can be made the same through picking the right ingredients and cooking it similarly, but the atmosphere and feeling of the certain location cannot be made the same. In that sense, I think the act of eating is made to be joyous not only from taste, but also from the other four senses. 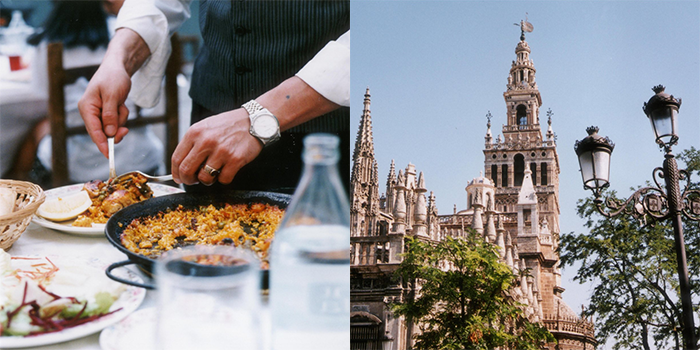 The paella I ate at Sevilla is left in my memory along with the dry air of Spain, the historical view of Sevilla, the warm and greeting attitude of the staffs, the music, and the feeling I had back then and the person I was having a meal with. It’s simply impossible to bring back all those aspects. When I think about that and apply it in my daily life, I realize that the current moment is something that will never come back again. I really wish I can live like that in my daily life.